The newly handed-down Supreme Court ruling on the Affordable Care Act has garnered a great deal of debate. The 6-3 vote in favor of the administration does nothing to fix the unworkable flaws that remain and continue to largely define Obamacare. No matter the lens used to view the ACA, the prognosis is bad. Back in 2012, Justice Roberts infamously interpreted the ACA penalty as a tax. Once again Roberts’ interpretive skills “saved” the day and the self-defeating piece of legislation much to the blatant disregard of the Constitution and the American people. Roberts looked at the plan as a whole and its three essential components: guaranteed issue and community ratings requirements, individual insurance purchasing mandates, and availability of subsidies for individuals at specific income levels. In the majority’s eyes, these three reforms were so closely connected that it was necessary all three had to remain intact to keep Obamacare from completely unraveling. In coming to his decision, Roberts concluded that it could not have been possible for Congress to intend to limit the flow of subsidies strictly through an exchange set up by the states only. In Roberts’ eyes, “state” and “federal” are essentially one in the same. Justice Scalia pointed out in his dissent that the choice of words was not merely a “drafting fumble” as the phrase “exchange established by the State” appears roughly seven times when mentioned in conjunction with tax credits. According to Scalia, “[i]t is bad enough for a court to cross out ‘by the State’ once. But seven times?” Even Roberts admits his divorce from the natural reading of the phrase in order to cement Obamacare. This decision is monumental in more ways than one and has devastating effects. But more so than Obamacare becoming the law of the land, there is greater significance behind this decision. The Court has demonstrated it is ready and willing to breach the Constitution and violate the cornerstone of our country’s founding: separation of powers. By acting well beyond its scope, SCOTUS has blatantly joined the executive branch in making the law--a responsibility reserved for Congress only. The decision further solidifies the growing concern that the current regime is beyond a doubt acting without constitutional authority. Not only has the Court taken on the role of the legislature more specifically, it has taken on the role of Congress’s power of the purse. In ruling “state” means “federal,” the Court rewrote Obamacare to authorize the IRS to spend billions of dollars in tax credits for these federal exchanges. Does RULE OF LAW technically exist any longer in the United States? Oaths of office are broken by the Executive branch, Congress and the Supreme Court... and there are NO consequences or legal remedy exacted. In my opinion, the United States needs what the British Parliament and Israeli Knesset both have: a LOSS OF CONFIDENCE VOTE... which requires a new and prompt election to be held. Multiple instances of TREASON have been committed... and no consequences... except commentator reports on the news. Interesting that an article directly above this one praises the Supreme court for its decision on the EPA but then in this article there is a ridiculous claim that they are " acting without constitutional authority". None of us figured the right wing media would simply be quite after both of last week's ruling but their reaction has been absolutely dumbfounding: that somehow since the supreme court didn't rule their way... well they must be unconstitutional then... or some other nonsense. Conservatives lost last week... and they will CONTINUE to do so... End of story. Suppose I rob a bank on Monday, and I don't rob a bank on Tuesday. Am I a bank robber or not? Sorry Mr Stone, but your semantics are flawed. 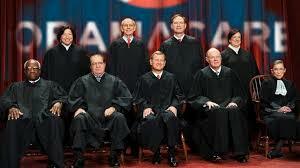 for a decision and retire these forecasters of their unconstitutional Ethical Malfeasance. In December, Judge Reed O’Connor released an opinion in Texas v. United States that struck down the Affordable Care Act (ACA), more commonly known as “ObamaCare,” because the individual mandate had been gutted by Congress in the 2017 Tax Cuts and Jobs Act. The rest of the law, he wrote, is “inseverable and therefore invalid.” The opinion represents the biggest legal threat to ObamaCare in nearly seven years. The Supreme Court issued an opinion on Wednesday that is a shot across the bow of defenders of civil asset forfeiture. In a unanimous judgment, the justices incorporated the Excessive Fines Clause of the Eighth Amendment to the states. The Court didn’t rule on the dubious constitutionality of civil asset forfeiture, leaving that issue for another day. FreedomWorks is proud to announce that our bill of the month for February 2019 is the Responsible Path to Full ObamaCare Repeal Act, H.R. 83, sponsored by Rep. Andy Biggs (R-Ariz.) and original cosponsors Reps. Matt Gaetz (R-Fla.), Thomas Massie (R-Ky.), and Paul Gosar (R-Ariz.). This bill would fully follow through on one of Republicans’ primary campaign promises since 2010: to repeal ObamaCare. On behalf of our activist community, I urge you to contact your representative and ask him or her to cosponsor legislation to repeal ObamaCare’s “Cadillac tax,” H.R. 748. Introduced by Rep. Joe Courtney (D-Ct.) and Mike Kelly (R-Pa.), the legislation would repeal the 40 percent excise tax that will eventually impact most employer-sponsored health insurance plans. Welcome to FreedomWorks Foundation’s second regulatory review of 2019! Our Regulatory Action Center proudly updates you with our favorite tidbits from the swamp. We want to smash barriers between bureaucracy and the American people by delivering regulatory news straight to FreedomWorks activists. Check back in two weeks for the next edition. Limited government conservatives remain disgruntled in Congress, both when in the majority and when in the minority. Republicans campaign on shrinking government, lowering taxes, embracing free markets, and upholding the constitution. But members who actually hold themselves to these promises once in Congress exist only in small pockets. On Wednesday, the Supreme Court heard oral arguments in Timbs v. Indiana. The case centers around the use of civil asset forfeiture and whether or not to incorporate the Excessive Fines Clause of the Eighth Amendment to the states. Although the Court won’t decide the case until next year, the oral arguments show that most of the justices appear ready to deal a long overdue blow to civil asset forfeiture. The Department of Health and Human Services (HHS), the Department of the Treasury, and the Centers for Medicare and Medicaid Services (CMS) have issued new guidance that will make it easier for states to get waivers from certain mandates under Section 1332 of the so-called “Affordable Care Act,” also known as the “ACA” or “ObamaCare.” The goal of the new guidance is to provide consumers with more private insurance options in the nongroup health insurance market. On behalf of our activist community, I urge you to contact your senators and ask them to vote NO on the Resolution to Undo the Expansion of Short-Term Limited Duration Health Plans, S.J.Res. 63, sponsored by Sen. Tammy Baldwin (D-Wis.). The resolution would use the Congressional Review Act to overturn a rule issued earlier this year by the Trump administration that expanded consumer access to short-term, limited-duration (STLD) health plans. STLD plans offer some of the only relief to consumers have as of now from ObamaCare’s Title I regulations that have driven health insurance costs through the roof.